The idea aurus 2 has the Android 4.1 Jelly Bean Operation System, 512MB RAM, 1GHz processor and 3.5-inch screen. The price of idea aurus 2 is Rs.6490/- with the price, idea aurus 2 also provide a internal storage of 4GB and expandable up to 32GB with microSD. This phone also has the connectivity features like, 3G, Buetooth and WiFi etc. 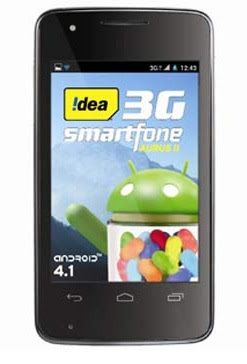 With this phone you also get Free 3G benefits worth Rs.1200. The idea aurus 2 now available in retail stores across India.